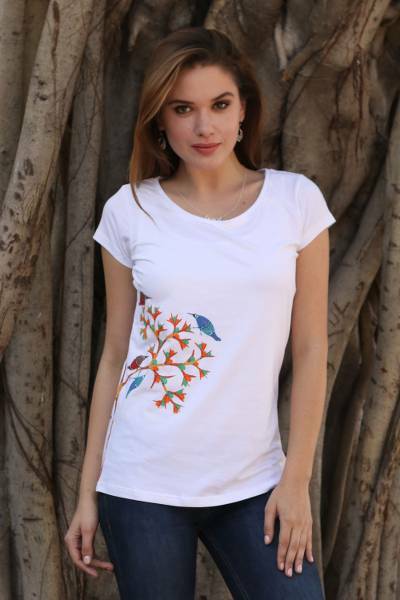 White Cotton Blend T-Shirt with Madhubani Painting, "Chirping Delight"
Vibrant shades of kelly green, Caribbean blue, crimson, and tangerine adorn this white t-shirt by artisans Vibhanshu and Tamanna of India. Using the traditional Madhubani style of painting, the artisans hand-paint on the front of the shirt a scene of birds perched in a blossoming tree. The t-shirt is made from a blend of cotton and spandex and features a rounded neck and cap sleeves.